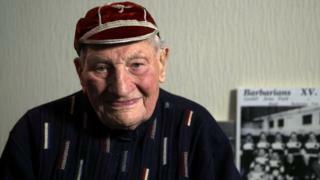 Meet Harry Walker, the oldest living former England rugby player as he reaches the age of 100. Walker recalls the "unbelievable" feeling of making his England debut at Twickenham in 1947, at the age of 32. He earned nine England caps in 1947-8, playing in every Five Nations encounter and against Australia.